Saturn shifted into Capricorn on December 19 2017, and--aside from a short stint in Aquarius--it will stay there until December 17 2020. Capricorn is Saturn’s home sign, meaning it most easily expresses itself there--its natural significations are accentuated. Some of Saturn’s associations are limitations, structure, authority, rules, delays, discipline, consequences, commitment, maturity, reality, and tradition. While these significations may not be particularly fun, they certainly don’t have to be negative: for instance, Saturn rewards those who have put in the hard work, and can help us to apply discipline and structure to achieve our goals. I believe one of the most important teachings of Saturn is how to accept responsibility for our own lives, how to embody our inner authority rather than either submitting to or rebelling against external authorities. 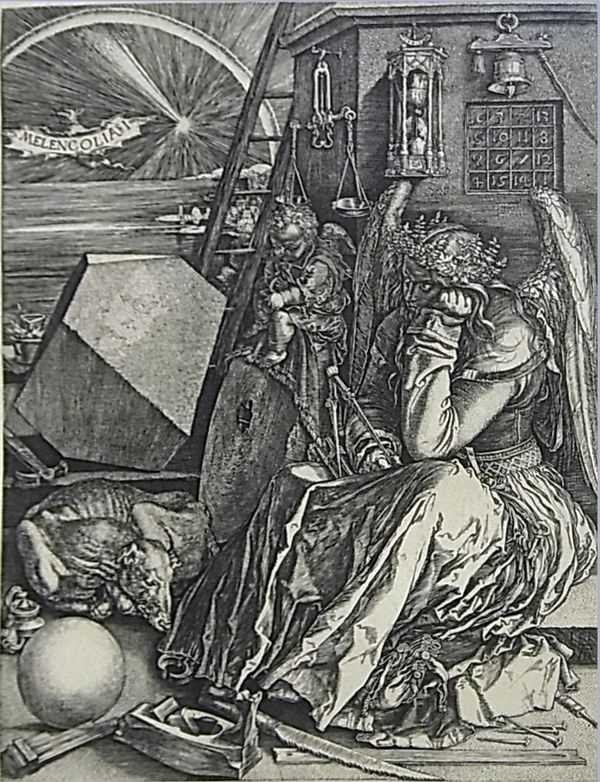 Saturn has long been associated with melancholy (see Durer’s depiction of Saturnian Melancholy). But melancholy was not always seen as negative. Rather it was seen as a contemplative disposition that tends toward reflection and intelligence. There is a certain heaviness associated with Saturn. It’s serious, it looks at life with perspective and realism, it respects boundaries and hard work. In a time when there’s a lot of pressure to be happy, and in some realms, not enough appreciation of allowing all manner of feelings, there’s a bias against Saturnian traits. But these qualities are part of the natural ebb and flow of a full life, and necessary for achievement and fulfillment. We can employ this Saturnian energy to great benefit over the next three years by getting organized, and deciding which areas of our life could use some discipline and structure. Saturn likes long term thinking--so consider where you wish to be in three years, when Saturn changes signs, in 7 years, when Saturn makes its square to where it is now, in 14 years, when it’s half-way through its cycle, and in 29 years, when it completes a full cycle. Saturn relates to aging and death (another reason Saturn gets a bad rap), so we might consider how we wish to die--dying well implies living well. Then work backwards--knowing where you wish to be in the future, what practices can you dedicate yourself to now that will get you there, what structures can you employ that will assist you. One of the more helpful aspects of this transit is that it will feel easier now to be disciplined and structured. For more specific information about what area of your life this transit relates to, see below. Look up your sun sign, and if you know your rising sign and moon sign, use those as well (to learn how to find these, sign up for my free course). Apply the information above to this specific area of your life. Expect to receive lessons in this area of your life over the next 3 years. As always, the more you work with the energy rather than resist it, the easier and more enjoyable will be the experience. I’m having so much fun writing about Saturn (now that Saturn’s in my 3rd house of communication--go figure), stay tuned for more. I plan to write about what Saturn in Capricorn signifies on a societal level, how to tell if you’re in your Saturn Return and what that means, and how to make Saturnian magic. Do you have anecdotes or examples that illustrate your Saturn transit? Please share your Saturn stories in the comments! Aries: Saturn is in your 10th house of career or vocation. This relates to the work you are meant to do, or feel called to do. This is not necessarily work you are paid for, although this transit could help you turn your passion into your career if that’s what you desire. This relates also to your public role, your ambition, and relationship to authority. Taurus: Saturn is in your 9th House of beliefs, philosophy, and higher education. This relates to how you understand the world, how you parse information, ways in which you seek to expand your mind, as well as your use of intuition. Means of refining your worldview include long distance travel, exposure to other cultures, higher education, philosophy, religious or spiritual views. Gemini: Saturn is in your 8th House of transformation, intimacy, and shared resources. This area relates to the literal and figurative death and rebirth cycle, the cycle of transformation, as well as intimacy, shared energetics/finances/space, sexuality, the taboo, the occult, other people's resources (inheritance, loans, grants, taxes, etc.). Cancer: Saturn is in your 7th house of partnerships: close, one-on-one relationships of all kinds including romantic partners, your spouse, close friends, business partners, as well as rivals. This areas relates to the ways in which you relate and what attracts you to others, and others to you. Leo: Saturn is in your 6th house of health, service and daily routine. This relates to your day-to-day schedule, rituals, chores, and tasks as well as skills and training, jobs and employment (work you do for income), providing a service for other, seeking to be of service. This area also has to do with health and well-being. Virgo: Saturn is in your 5th house of creative self expression which relates to recreation, play, pleasure, children, games, and romance. This has to do with your unique way of expressing yourselves, expression that feels natural and true to the self and signifies all forms of creativity. Libra: Saturn is in your 4th house of home and family. This relates to your actual as well as metaphorical home, family (biological as well as chosen), people you live with, your ancestry, roots, and homeland. The 4th house also signifies your primary caregiver and relationship to them, as well as the unconscious patterns of behaviour that developed in early childhood. Scorpio: Saturn is in your 3rd house of the mind and communication, which includes thought processes (the logical, linear mind), perception, speaking, writing, visual communication, sending and receiving messages of all kinds, transactions, commerce. This area also signifies your immediate environment, neighbourhood, short-distance travel and transportation, as well as siblings, and early childhood education. Sagittarius: Saturn is in your 2nd house of material security and abundance, including income, resources, finances, values, the body, and self-worth. This relates to what you value, what you invest in (in terms of thought, time, energy, money, resources), your belongings and property, as well as your self-worth and self-esteem. Capricorn: Saturn is in your 1st house of identity and personality including your interface with the world, how you approach the world and the world approaches you, how you understand yourself, how others see you, your physical appearance, the first impressions you make. This area also relates to endings and beginnings, the initiation of a new cycle. Aquarius: Saturn is in your 12th house of the unconscious mind, including aspects of yourself that are normally hidden, dreams, the imagination, symbolism, synchronicity, psychological complexes and neuroses, hidden gifts, spirituality, unitive consciousness, transcendence. Pisces: Saturn is in your 11th house of friendships, networks, community, groups, and organizations. This area relates to both belonging and exclusion, as well as hopes and wishes for the future, humanity and humanitarianism, social media, friends, and acquaintances.